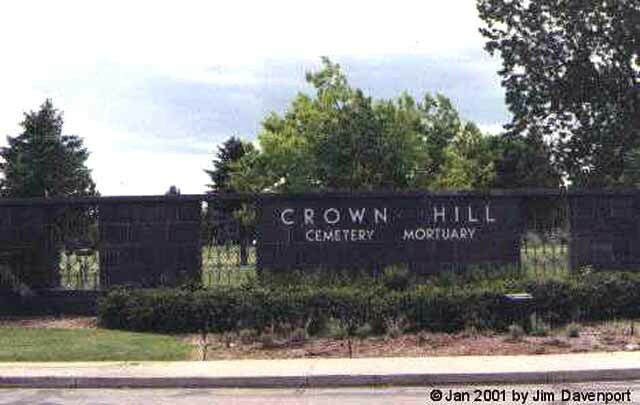 The Olinger Mortuary's Crown Hill Cemetery, established in 1907, is located at 7777 West 29th Avenue, Wheat Ridge, CO 80215. T. Joseph Edwards b. 26 Dec 1876, d. 07 Mar 1931; husband of Alta Adel (Burch) Edwards. Block 68, Lot 60. Unit D, Section 2. Alice E. (Koch) Garnier, daughter of Conrad & Mary Hannah (Topliss) Koch, married Arthur A., July 14, 1910. Arthur A. Garnier, son of Paul & Lucy (DeGree) Garnier. Daughter of Fredrich & Sophia Louisa Hechtner of Iowa. This is her second husband. Her first husband William Wren is buried in Mt. Orum Cemetery, Redfield, Kansas. William Henry Meyer is buried next to his wife, Mary (May) Elizabeth Clark Meyer [no photo]. They are in Lot 132, Block 65, #3030, sections 3 and 4, respectively. Beloved mother of Sherylynn Kay Robinson and Michael Gary Robinson. Granddaughter of Peter Edward and Sarah Louise Carpenter, Farrell. Block 68, Lot 60. Unit A, Section 4. Minnie Ellen, daughter of Alonzo Sylvester & Mary Elizabeth (Lyons) Huffman; born 7 Apr 1886, died 15 Oct 1956; wife of William E. Van Volkenburgh. Mary Elizabeth, daughter of Wesley & Caroline Lyons; born 15 May 1866, died 16 May 1936; married 1st Alonzo Sylvester Huffman; married 2nd William Wagoner.